It was a frustrating night for the Dolly Blues in their first away trip of the season at Victoria Park on Tuesday. Phil Brown’s side created a raft of chances in a game they should have won comfortably, but disappointing form in front of goal meant they could only take a share of the spoils. The game began with an even but bright opening with an early chance for both sides. Mike Hale had to be sharp to hold onto Elliott Nevitt’s free-kick before down the other end Jordan Connerton had a shot with his weaker foot easily saved by Burscough stopper Xavier Parisi. As City began to gain a dominant foothold in the game, the chances began to come but they were all spurned as Lancaster unbelievably looked low in confidence in front of goal despite such a prolific pre-season. Firstly a fantastic through-ball from Billy Akrigg set Connerton in on goal but his shot was dragged agonisingly wide of the post. Minutes later a great determined run from Oliver Crolla set the winger through into the box from the right wing and he picked out Simon Wills on the penalty spot. The midfielder elected to take a touch rather than hit it first time into an unguarded net which allowed two defenders to get back and block the eventual shot and the chance was gone. Wills then had another half chance as he acrobatically volleyed wide from inside the box as the half ended goalless. The second half continued as the first ended with City creating all the chances but missing them, some by the proverbial mile. The first chance came after some fine link-up play between Crolla and Connerton but neither elected to shoot with a clean site of goal and the eventual shot by the City forward was well blocked and cleared to safety. Lancaster did have the ball in the net when Akrigg’s free-kick was headed home by Ricky Mercer, but the referee blew for a foul to cut short the celebrations, stating the skipper had illegally impeded his man. Connerton had City’s best chance of the half six minutes from time after a fantastic run on the counter attack from the halfway line. Turning past his man on the edge of the box the striker found a clear sight of goal but scuffed his shot horribly wide. As the game petered out City huffed and puffed but never looked convincing in the final third. Akrigg volleyed a shot wide from a tight angle in the last half chance of the game before the Dolly Blues were denied what looked like a sure penalty in added time. After beating his man on the left flank Danny Shearwood drove into the box and looked up to cross the ball before being clattered from behind by defender Reece McNally. Referee Alex Kirkley wasn’t interested however as the game remarkably ended goalless. 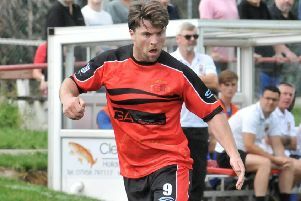 Star Man: Ben Hudson - Assured displayed on his return from injury.